YORK COUNTY, SC – In an attempt to deter shoplifting crime in York County, Sheriff Bruce Bryant is teaming up with Crime Stoppers of York County in a unique Crime Prevention initiative. Shoplifters steal from all types of stores including department stores, specialty shops, supermarkets, drug stores, discounters, music stores, convenience stores and thrift shops. Locally, in the last two years, York County Sheriff’s Deputies have investigated approximately 290 shoplifting cases. To date in 2015, Deputies have responded to more than 120 shopliftings. Nationwide, more than 10 million people have been caught shoplifting in the last five years. 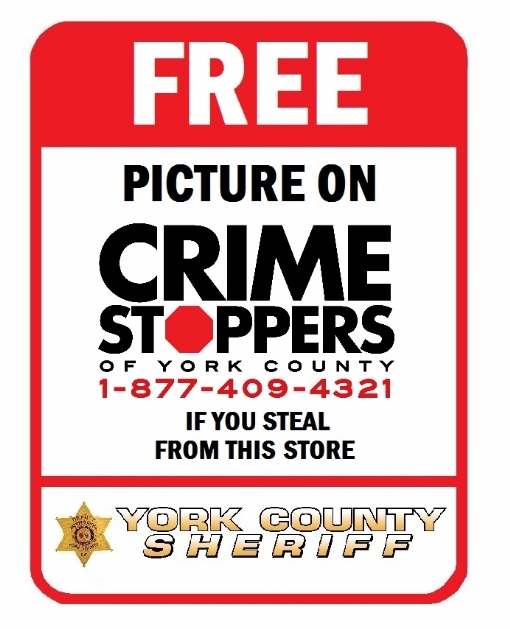 To combat this continuing trend, moving forward to the holiday shopping season, the York County Sheriff’s Office in coordination with Crime Stoppers of York County has developed a unique decal to get the attention of potential thieves. Decal stickers will be available to business owners that read. “FREE – Picture on Crime Stoppers of York County – If you steal from this store.” Using social media and www.yorkcrimestoppers.com, the hope is someone will think twice before stealing an item or items from a store with the fear their photo will be shared multiple times on the internet and through the news media. These decals are in limited supply. Business owners who would like a decal are asked to contact the York County Sheriff’s Office and ask for the Public Information Officer or Crime Prevention Officer to request a decal. Also a number of decals will be distributed to the Sheriff’s District Commanders to give to businesses they feel may be in need of a shoplifting deterrent. 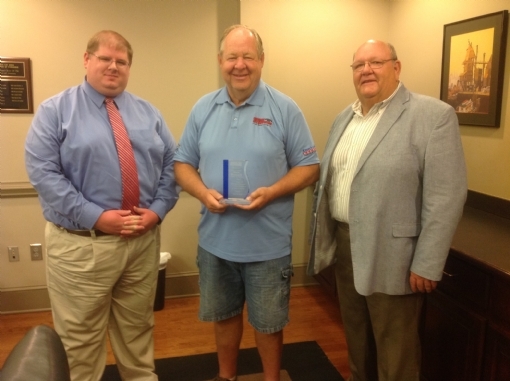 YORK COUNTY, SC - On May 20th Crime Stoppers, Sheriff Bruce Bryant & Board Chairman Andrew Kiel presented a Service Award to Ron Russell for his 15 years of dedicated service to Crime Stoppers of York County. Mr. Russell has served on the Crime Stoppers of York County since the inception in 2000. Mr. Russell has been a valued member of the Crime Stoppers board and we thank him for his years of service. Since the year 2000, Crime Stoppers of York County has helped law enforcement agencies make more than 1,300 arrests, paid more than $35,000 in tip rewards, and more than $600,000 in illegal drugs confiscated. YORK COUNTY, SC - In efforts to assist Law Enforcement agencies in York County solve crime, Crime Stoppers of York County has branch out into the Social Media realm. Crime Stoppers of York County is a citizen and police cooperative program designed to involve the public in the fight to stop and prevent crime in York County and all municipalities. Citizens are asked not to post crime information via these Social Media sites because the anonymity of the Crime Stoppers program. By calling 1-877-409-4321 or submitting a tip on line via www.yorkcrimestoppers.com or clicking here people do not have to give their name or any information about their identity. To learn more about the Crime Stoppers program of keeping citizens identities safe click on the How it Works tab. YORK COUNTY, SC - On September 4th 2014, come out an support Crime Stoppers of York County at Spirit Day at Chic-Fil-A Cherry Road Rock Hill. 15% of net proceeds will go to support the 501(c)(3) organization of Crime Stoppers of York County. This is an all day event, however from 5:00 pm to 7:00 pm members of the Crime Stoppers Board of Directors and members of Law Enforcement will be on hand to answer questions and refill beverages. On Wednesday, April 23rd, 2014, between the hours of 6pm and 9pm, Moe’s of Rock Hill (located at 1910 Cinema Drive) will graciously host a ‘spirit night’ for Your local Crime Stoppers of York County. Proceeds from tips received and donations received will directly benefit the local Crime Stoppers program, so that the tradition of an anonymous reporting system for crime can be continued. Please join Crime Stopper of York County at Moe’s Soutwest Grill in Rock Hill, for great food and watch as the local Board of Crime Stoppers wait tables, cleans up, and yell “Welcome to Moe’s”, all the while enjoying some great food!! Crime Stoppers of York County won three awards last week at the Southeastern Crime Stoppers Training Conference held in Myrtle Beach, South Carolina. The annual training conference brings together Crime Stoppers programs from across an eleven-state area. Crime Stoppers assist law enforcement by providing an anonymous tip-line, and by offering rewards for tips that lead to an arrest, a seizure of contraband, or the recovery of stolen property. Crime Stoppers programs belonging to the Southeastern Crime Stoppers Association submit statistical information regarding their productivity in areas of arrests, seizures, and recoveries resulting from tips. Crime Stoppers programs are judged against other programs that have similar population densities. Crime Stoppers programs can also submit fund raisers, advertising campaigns, and other activities for judging in multiple categories. In the area of performance, Crime Stoppers of York County won the Productivity Award. Crime Stoppers of York County also won the Most Creative Advertising Award for their 2009 Arresting Crime InfoFest event. For the same event, Crime Stoppers won the Premier Management Award. This conference was attended by York County Sheriff’s Office Lieutenant Mike Baker and Crime Stoppers Board members Jack Addison and Bob Pearse. “Hoot” Gibson attended representing his wife, Crime Stoppers’ Board Chair, Fay Gibson.